If you&apos;re looking to have an insane amount of fun while in the South Shore, you&apos;re in luck. The recently opened JAK&apos;S Warehouse is home to so many different activities you&apos;ll want to visit this great attraction more than once. From young to old, there is serious excitement and fun for everyone. The first time I visited JAK&apos;S Warehouse, I wasn&apos;t too sure what to expect with pricing. However, I was very happy to find a range of pricing available for the different attractions. You can either choose a 4-hour unlimited wristband, or pay as you play. The 4-hour wrist band was a really fantastic deal, but because my friend and I stopped in spontaneously about 8 p.m., we opted for a pay as you play card. When you choose this option, you can receive additional play points depending on how much you spend, which can get you some arcade time! After taking a quick walk-through of the entire place to see what we wanted to try, we decided on the Sky Trail. There are two different levels of this - for those 44" and taller, or those 48" and taller. I was really excited to try this! 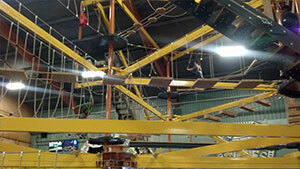 This sky obstacle course takes you nearly to the ceiling using rope and planks of boards. Of course, you&apos;re harnessed in, but it still got pretty scary so I had to hang on for dear life! With some extra points left over, we were able to check out some of the games in the arcade. They have a really great selection of games here, but the one that immediately drew our attention was the giant Connect Four board. We were able to play two games with the extra points left over on the card. This was only a small taste of what JAK&apos;S offers, but we certainly enjoyed our time there and plan on going back. Other attractions include a laser maze and laser tag, go-karts, bumper cars, 9-hole mini golf and ballocity, which is a four story, multi-platform climbing environment that allows guests to fire play-safe foam balls, or dump buckets of them, on one another. There are also party rooms available and JAK&apos;S will host corporate events, as well! Whatever the reason you&apos;re planning a trip to JAK&apos;S Warehouse, it will be non-stop fun the entire time. 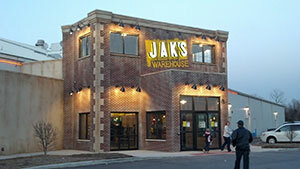 Find out more about JAK&apos;S.